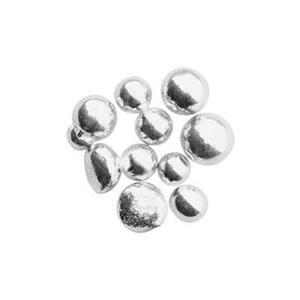 This .925 sterling silver grain is perfect for melting or casting. Whether you mix it with your sterling silver scrap or not, you’ll love the quality pieces it produces! Very good but pricey of course. Will reorder when I can. SS Grain is probably SS Grain just about anywhere. But what makes Halstead Beads' SS Grain awesome is the stellar customer service and lightning fast shipping along with price which is always a few bucks less than the big guys (beading websites). I love the small, family-run feeling about Halstead and the quality products I have come to enjoy. Halstead Beads is my GO TO beading website and especially for SS grain which I leave to the last minute, but Halstead always delivers right in time for my Lost Wax Casting class. Halstead always offers competitive pricing and super fast shipping. Their SS grain is quality and produces lovely pieces in my Lost Wax Casting class. Casting grain is the best way to cast! It has the lowest manufacturing costs, and with Halstead you know that the quality is always up to par!